Take a look at the unlimited opportunities for a One Day Bahamas Cruise from Fort Lauderdale…the specialized activities are amazing. Active families, couples and singles, are all drawn to the outdoor sports adventures offered in this sun-drenched, preferred vacation location. Para-sailing, deep-sea fishing, taking glass-bottom boat with snorkeling tours, and the Everglades air-boat tours, all considered exceptional, one-day cruises that begin in amazing, fun-filled Fort Lauderdale. The Balearia Bahamas Express leaves terminal 1, Port Everglades, in Fort Lauderdale, for an all-day round trip sight-seeing tour. This catamaran, designed to ferry 463 passengers with 80 vehicles at the speed of 32 knots, leaves the port at 10:00 am. The last departure from Freeport Harbour, is 7:30 pm, and arrives back in Fort Lauderdale at 10:00 pm. Kids under 6 years old travel free. If you don’t have a visa for the US, you can now apply for ESTA online. This one-day Balearia Bahamas Cruise has a world-class lounge area, 1st class casino slot machine areas and a dining area with a fully loaded salad bar. Additional luxury items include free Wifi, full bar, and a duty-free gift shop. The spacious areas through-out this express ferry are of top-class design and comfort which includes ample cushioned seating areas in various parts of the sea-craft. World famous Fort Lauderdale, promotes shore excursions such as “The Venice of America” cruise, featuring spectacular cityscapes, and views of the waterfront with awesome yachts and mansions. Patrons will enjoy refreshments while floating down the New River on the Intracoastal Waterway. 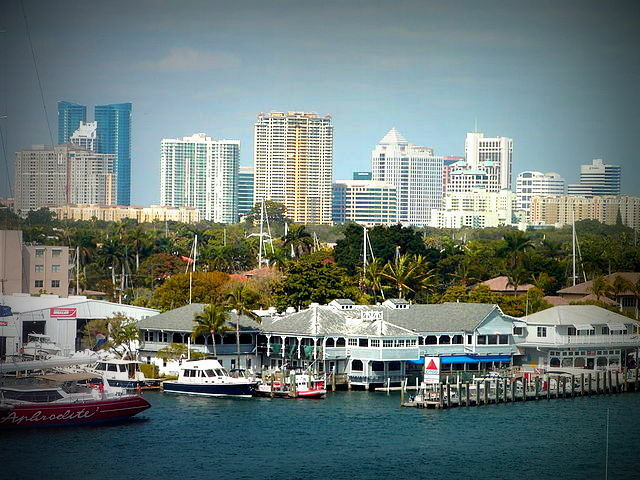 What Kind of Fun Day Trips Are Offered in the Fort Lauderdale Area? For a wild-life fun-filled day, adventurers must experience the Anhinga Trail. It has nine distinct habitats for naturalists to explore. There are many unusual birds drawn to the sedge growing in the marsh prairie ecosystem. This trail, named after the Anhinga or “snakebird”, a swimming bird that actually hunts slower swimming fish underwater and spears them with their long, sharp beaks. Visitors are sure to see alligators on this trail, as a huge variety of wildlife are at home here. Try to catch favorite day trips while at the Everglades like Shark Valley, the Nine-mile Pond Canoe Trail and the Gumbo Limbo Trail, as well. For an example, teachers who have taken their students to Shark Valley from as far away as California, send in evaluations stating that their student trips to the Everglades had their students and teachers alike, enthralled with the natural wildlife settings in Shark Valley. Kids of all ages thrill from hearing alligators bellowing to each other, interactions and facts about the various habitats and different wildlife living there. Visitors all learn valuable information and insight from the well-trained tour guides. We hear reports of the incredible patience of our guides as they stopped the trams for students to photograph animals and birds while asking constant questions. Teachers are confident in the safe execution of the guided trams tours in Florida State Parks. Bike riding tours of the wild-life trails are also popular and appropriate for the high school aged student groups exploring the Everglades as well. The school year months are the best time to schedule trips for a One Day Bahamas Cruise from Fort Lauderdale FL and the Everglades to avoid the mosquitoes that come out in the summertime really enjoy feasting on tourists! What are you waiting for – let’s book your day trip to the Bahamas today! One Response to Fun Day Trips to take from Ft Lauderdale!